These Portable Easels are Ideal for Open Floor Areas! 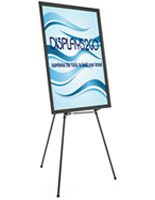 Develop Your Own Presentation that Catches Every Passerby's Attention! Portable Easels are an Indispensible Tools for Many Industries! Slim, collapsible design requires minimal storage space. Adjustable headers fit any canvas up to 51-1/2"h x 7/8"d.
Leather handle makes carrying and transportation easier. Belted strap holds frame together when collapsed. Rubber feet protect floors and prevent movement. These lightweight flipchart field stands, beech wood portable easels are easy for any artist to assemble. These stands can be used right out of the box, with no tools or hardware required! These floor display stands, portable easels collapse and measure 5-1/4"w x 37-3/4"h x 3-1/8"d, a compact size for travel. This feature gives the artist the option of storing this presentation rack in a closet, under a piece of furniture or in the trunk of a vehicle. These portable easels, that can be easily carried, come equipped with a 4-5/8"w x 13/16"h leather handle and a fastening strap that holds the entire display together. These quality flipchart stands were certainly designed with presentation and mobility in mind! Portable easels that can be used in the field, like the ones seen here, are also found in studios and schools! These affordable display racks can be stored standing upright in a classroom, which gives students the unique opportunity to learn how to draw, sketch or perform a presentation on one of these quality stands! These wooden artwork field racks, adjustable portable easels are ideal for any artist who likes to travel and compose art. These flipchart presentation holders can be used indoors or outdoors. User can also adjust each leg accordingly, to ensure the stand stays level on any surface! 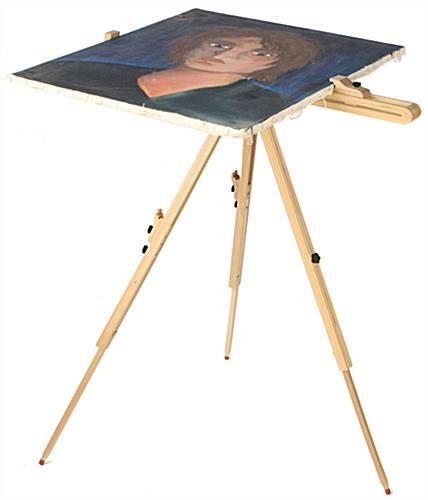 Portable easels, such as these sturdy art holders, are practical for any on-the-go field artist. In a matter of seconds, the collapsed 37-3/4" frame can stand 83-1/2" tall! These flipchart floor units can also be tilted and adjusted to any height or angle. These portable easels that are used during travel and in the field are also lightweight and functional! Many distinct features make this wooden stands essential for any type of artist! 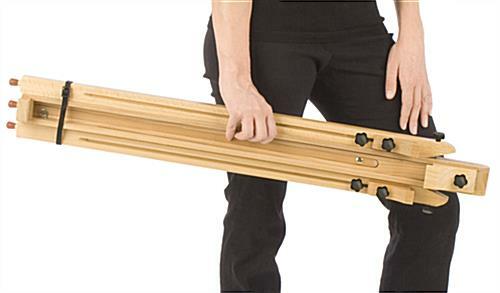 Buy these portable easels for your studio or for home use. 29.3" x 82.5" x 30.5"
5.3" x 37.8" x 3.1"